Chantalynn is a busy “mompreneur” with a zest for life and bills herself as a “Curator of All Things Great”. She is a dedicated mom to her 13-year-old son. She came to America as a Vietnamese refugee back in 1977, one of the thousands of “boat people” - ask her about her harrowing journey and you will see why she is so passionate about everything! Known in the nail industry as an eco-conscious celebrity nail stylist, Chantalynn is a Beautycounter consultant promoting safer skincare and cosmetic products. She also works as a Regenerative Lifestyle Coach who loves to help others infuse love and joy in all that they do so they can thrive. Chantalynn lives and breathes knowing that what you put in your body, on your body, and around you matter... AND... you need the Body, Mind, and Spirit connection. Her clients enjoy working with her to find their authentic sense of style and a way of being that help them see the magic that is already there in their everyday lives. Her enthusiasm for the environment runs through all her work, as well as, her favorite topic - food. She is more than just a foodie, she knows that healthy soil is the foundation for all great food, and that food is medicine. Chantalynn is active with Cancer Schmancer, Fran Drescher’s non-profit organization. Fran is one of her dear friends and a “big sister” to her. 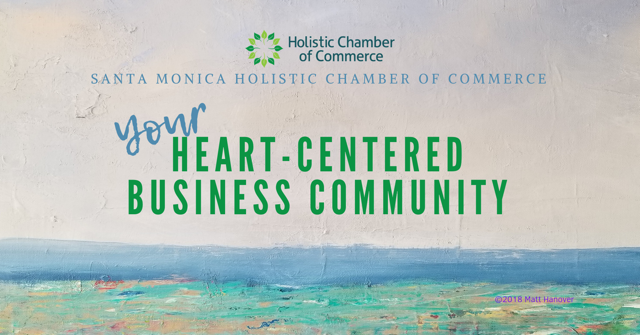 She is proud to be the President of the Santa Monica Chapter of the Holistic Chamber of Commerce. She speaks fluent English, Vietnamese, French, and “Menu” in many more languages. How to rev up Q2? Parking Info: Street Parking so please allow ample time. What do we need to do to rock our businesses? Our experts will share their tips on Publicity, Networking, and Sales to help us rock Q2! Paula D’Andrea is an expert at grounding frazzled small business owners who are stuck in rapid growth overwhelm so that they can continue scaling with renewed spirit and power to reach their bottom line with the most energy, focus and momentum possible. She has been featured on/in The Wall Street Journal, Forbes.com, 2 Amazon International Best Sellers, KTLA, KNBC and Telemundo. Eric Oxenberg is the owner of Coincident Ideas, a marketing and communications company in West Los Angeles. He's been a marketing and advertising professional for over 25 years and has lived in L.A. since 1980. After studying graphic design and commercial photography at Santa Monica College, Eric opened his own creative studio in Venice, California. By 1990, he’d worked with major agencies such as Ogilvy & Mather, J. Walter Thompson and Team One, producing work for IBM, Toyota, Microsoft and other national brands. In 1996, Eric was invited to help develop Lexus.com, the first automotive website in the world. He has been doing online marketing ever since, and now specializes in rebranding business websites and producing high-level marketing campaigns for small and medium-size businesses. Eric’s focus is on finding the authenticity and personality of every business, by listening to and understanding it’s leaders, and communicating to their audience in a clear and engaging manner. Street Parking so please allow ample time. The meeting starts at 7 pm, please arrive on time. Organic light bites will be provided by Meals with Marie. Organic wines will be served.